As I said in previous posts about the LMS Ely to Walsingham Pilgrimage, I had never prayed the Rosary in Latin before and I was quite taken with it because it was strikingly the same, yet different. I still have the LMS booklet with all the prayers used in the Rosary in Latin and in English and so last night dug it out and prayed the Rosary in Latin on my own for the first time. I really like it in Latin. I get the feeling that it is more suitable for prayer because it is more respectful of God's majesty and transcendence but the prayer is still definitely filial. Something about it is a little more meditative as well, more soothing to pray. It seems to free you up to think about the mysteries rather than concentrating on the meaning of the words - which is ironic given that to us the language is foreign or even alien. I'd recommend giving it a go, if you haven't tried praying the Rosary in Latin already. I also got the feeling Our Lady likes it in Latin. Of all ladies she is the beautiful Lady and a beautiful lady deserves romantic and beautiful language which is mysterious and reverent. I also find it quite appealing praying in the language that Sts Francis, Dominic and countless others prayed, but that could just be a hint of Pride. Fr Bede (who appears today on Juventutem's blog told us Our Lady also likes one decade in French. Now that is laying it on thick! I'm sure if you search for it in French you will find it online. Someone has created a Rosary in Latin blog which you can read here. Say a decade in Latin for the SSPX, why not, that way you'll make Our Lady, (most likely) the Holy Father and the SSPX happy at the same time. I learnt the Hail Mary in Latin long before I found it in English by listening (secretly!) to Radio Vatican. Later I borrowed a French missal from a friend and learnt it in French, still before I discovered it in English. Anyone who wants to hear the Rosary in French should go to the official Lourdes website at 15.30 French time (14.30 British time) and they will be able to see and hear the Rosary prayed from the Grotto. During the nightly torchlight procession in Lourdes many different languages are used and the Pater Noster is now included in Latin although I have yet to hear the Hail Mary in Latin there. Sinalese, Serbo Croat, Vietnamese - it is beautiful to hear the prayer in so many languages but I do hope one day they will include Latin. At least the Credo and the Salve Regina are sung in Latin which unites everyone whatever their nationality. Thank you Laurence! I like the sound of this, especially the French. I am no linguist to be sure, but I do love to hear the rosary prayed in all languages and I had forgotten how I enjoyed this!!! 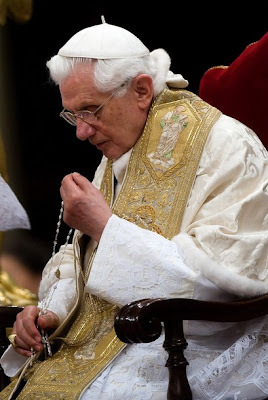 Although I have moaned about some Fr Z's posts, he does have a Latin rosary he sometimes posts (sorry, no good with computer terms, anyway you can download it or something and pray along). It sounded heavenly, to be frank! This has cheered me up, this post! Thanks again. Now for a search for a French rosary online! As for a decade for the sspx, I feel all peculiar even thinking about that. They'd probably have me burned at the stake if they come back to the church fully! Come on the Chartres pilgrimage one year and you'll sing decade after decade in Latin. Magnificent! I've been praying the Rosary in Latin ever since I learned, from Fr. Chad Ripperger, FSSP, that it is more efficacious and meritorious to do so, as Latin is the sacred tongue of the Church.